For those teams that are headed to the fantasy football playoffs in the next week or two, odds are you made good choices with personnel moves. Wide receiver has been a particularly fruitful area for those owners that chose the right players from the waiver wire. With one week to go, a replacement player may still be necessary. If not, it never hurts to stack the deck in your favor or grab a player that your opponent could use to beat you. That was a rough week; I don’t think that I could have made worse picks if I tried. Still, it happens to the best of us and I guarantee that this week’s picks will pan out better. Funchess is still too raw to rely on every week, but his schedule dictates that he should be owned. Huff was a bust as was the entire Eagles squad. A beatdown like that cannot happen every week, but Huff is safe to drop. Latimer went back into hiding, that either means another month of winter or he should not be on rosters. J.J. Nelson is still a tertiary option not worth owning. Kendall Wright is still working his way back from injury and had a lackluster day in week 12. Still, he was the Titans undisputed top receiver before he was injured and he saw seven targets against the Raiders. Wright did not suffer a setback on Sunday and should continue to improve as he knocks of the rust. This is a very talented player who is available in many leagues and I would suggest picking him up if you play in one of those leagues. I recommended Baldwin once earlier this season and he burned me with a low point total the next week. While that could happen again in Seattle’s unpredictable offense, it seems like Baldwin is playing a very large role at the moment. With other receivers failing to step up, Russell Wilson has a lot of trust in Baldwin and should continue to look for him in tight spots. Baldwin will probably not match his point total from Sunday for the rest of the season, but double digit points are within reach every week. Being healthy in San Diego makes Inman interesting. 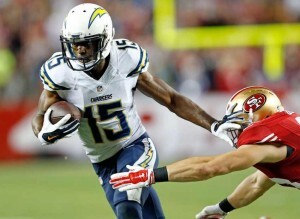 Inman has not been massively productive this season, but he has become a popular target for Philip Rivers. The Chargers have not been healthy all season long, particularly in the receiving corps. On the merit of being one of the last men standing, Inman has some appeal as a flex player moving forward. Just keep in mind that the Chargers take on a tough Denver defense in week 13 and Inman may not have the ability to get open against top flight defensive backs. He will have opportunities, however and that may be enough.